A month of so back I took part in a challenge from Lean on Turkey to create a family meal using turkey for under a tenner – and came up with a turkey, ham and pasta bake. Challenge number 2 was to come up with a lovely low fat turkey dish, again for under a tenner, and I made these turkey koftes. There is nothing like food on a stick. I baked these in the oven, but they would cook just as well on the BBQ. Ring the changes by varying the spices (use mint in place of the coriander) and make sausage shaped koftes rather than balls. Be generous with the spices, with about 2% fat the turkey breast mince is very low fat, and can take lots of flavourings. 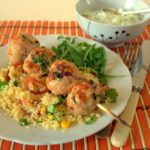 If you have any leftover cous cous simply whack it into a pan, crack and egg over and make some easy and delicious egg fried cous cous, and for more kofta inspiration try my beef koftas with sag aloo. 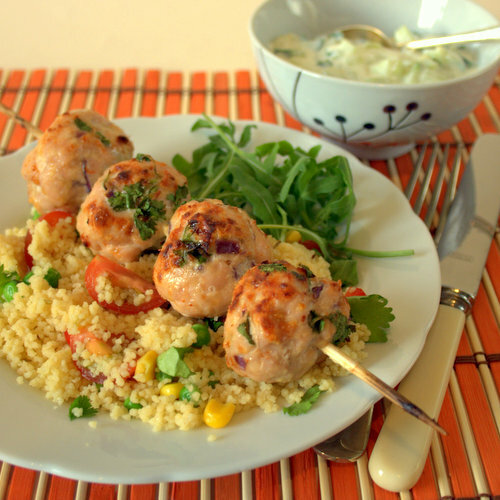 If you try this Recipe: Turkey Koftes with Cous Cous Salad & Tzatziki please tag #FussFreeFlavours on Instagram or Twitter. It is amazing for me when for me when you make one of my recipes and I really do love to see them. You can also share it on my Facebook page. Please pin this recipe to Pinterest too! Thanks for reading Fuss Free Flavours! Add boiling veg stock to couscous, with frozen peas and corn. Glug in the olive oil, the quartered cherry tomatoes and finely diced red pepper. Leave to stand for 15 minutes, fork through to fluff. Soak the skewers in water for an hour before using. Grind the cumin and chilli in a spice grinder. Place turkey breast mince in a bowl. Break in egg, add cumin and chilli powder, onion, lemon zest, coriander, breadcrumbs and salt and pepper. Mix together, divide into 20 and form into balls. Thread balls onto barbecue sticks, and place on baking tray. Bake in oven at GM5 / 190C / 375F for 30 minutes, and finish under the grill for 5 minutes to brown.